Starting Thursday, March 7th, Binance will kick off their decentralized exchange testnet trading competition, putting USD $100,000 up for grabs in Binance Coin ($BNB). The competition will officially start at 8:00 AM (UTC) on March 7th, and run until the 21st (at 8:00 AM UTC), with first through third place taking home 1,000-3,000 BNB (1,000 for third, 2,000 for second, 3,000 for first). 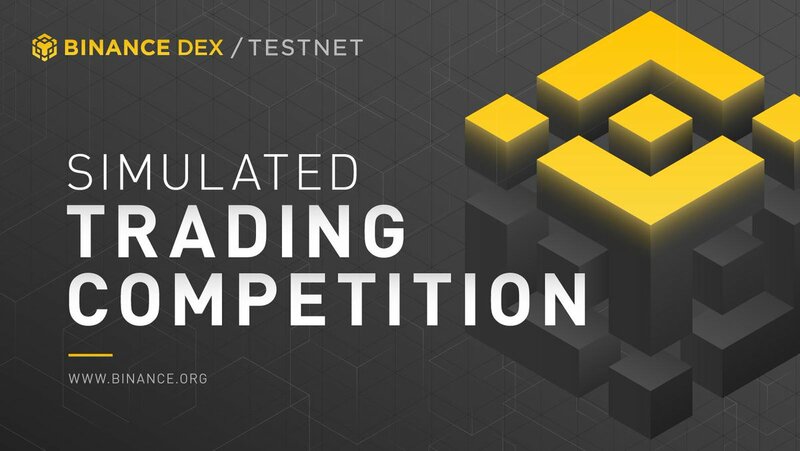 Binance’s testnet trading competition is aimed at increasing awareness of the Binance DEX, which launched its testnet on February 20th, 2019. The $100,000 BNB pot is up for grabs for any user who holds at least 1 real BNB token in their Binance account, and every Binance.com account is able to register up to a maximum of 20 Binance Chain addresses. Users will start with 200 virtual testnet BNB tokens in each address, and hit the ground running from there. But wait, there’s more. Binance is actually holding two distinct trading competitions, which we’ll take a further look at. They also provide guides on how to issue and list tokens, noting that each issued token must have at least 20,000 unique addresses holding the token during the competition period to be eligible for a reward. For Contest 1, users will take home 3,000 BNB for first, 2,000 BNB for second, and 1,000 BNB for third. Binance’s second competition will determine a winner based on the absolute returns achieved using trading strategies on BNB, BTC.B, ETH.B, USDT.B, and XRP.B. All four non-BNB tokens will be settled at a historical average price at the end of the trading competition to the BNB equivalent. The absolute return calculation is as follows [Final holdings – (open holdings + holdings transferred in)]. Contest 2 offers up 20 prizes, which range anywhere from 50 BNB to 1,000 BNB. Note that at time of publish, Binance Coin is trading at USD $11.59, with a market cap of roughly $1.6 billion. With DEXs having been historically plagued by low liquidity and volume, Binance’s DEX stands to shake up the game quite drastically, as not only are they bringing about a loyal and gargantuan user base, but an easy-to-use UI and platform for crypto novices. And, they’ve done it at an unprecedented pace, having gone from crypto exchange newcomer to the largest cryptocurrency exchange in the world (in terms of trading volume) in less than 1 year. Besides the deployment of Binance’s decentralized exchange testnet, Binance has also seen the rollout of Binance Uganda in October 2018, fiat to crypto purchases with debit and credit cards in January 2019, and several major listings in 2019. Make sure to follow our cryptocurrency blog for all the latest updates, news, and informative blockchain articles! And, don’t forget to follow us on Twitter and Medium. We’d love to hear any article topics you think we should write about this 2019.